Spinal Muscular Atrophy (SMA) is a genetic disease. It weakens the muscles, making it difficult or, in most cases, impossible for a person with SMA to move around and do routine physical tasks like getting dressed. People with SMA may be able to stand when they are very young, but few ever possess the ability to walk. And for those that do, the ability is short lived. That is because SMA gets worse over time. Weaker muscles not only affect one’s ability to walk, but to breathe and pump blood through the body. To a person with SMA, a simple cold is a dangerous threat that, if ignored, can easily and quickly become a case of pneumonia. SMA is fatal—many times because of respiratory and pulmonary complications. You might hear us say that SMA kills more babies than any other genetic disease. That’s true, but not everyone with SMA has the same life expectancy. SMA is categorized into four types based on how severe the symptoms are. Type 1 is the most severe and type 4, a rare adult onset form of SMA, is least severe. Children with SMA type 1 can have drastically shortened lifespans—many times just a handful of years. SMA is the number one genetic killer of children under two. One in 40 people carry the gene that causes SMA. One in 6,000 babies are born with SMA. There is usually no previous family history. SMA affects people of all races and genders. The National Institute of Health selected SMA as the disease closest to a treatment of nearly 600 neurological disorders. Researchers believe that a treatment will be found within the next 5 years with the proper resources. Doctors usually diagnose SMA type 1 before the child is three months old. Children with type 1 are unable to hold up their heads and sit up. Their limited ability to move can cause contractures, which can cause children with SMA to lose range of motion in their arms and legs. 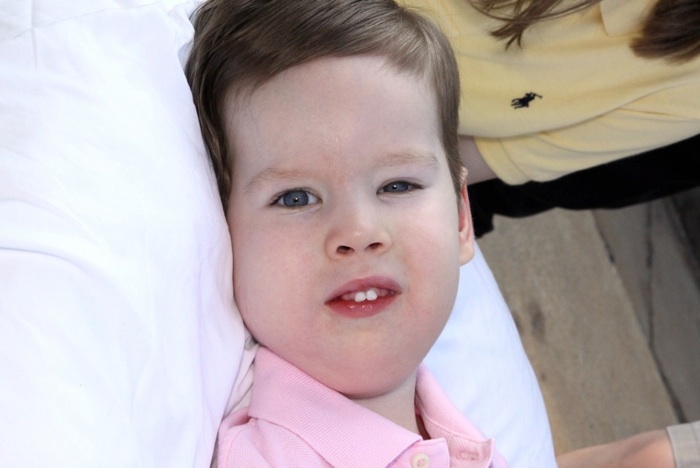 Children with SMA type 1 have difficulty sucking, feeding, and swallowing and usually need to be fed through a tube in their stomachs. SMA also weakens the chest cavity muscles, which produces a weak cough. Children with type 1 find it difficult to breath normally and fight off respiratory infections. Weak muscles in the back cause scoliosis, or curving of the spine. Doctors usually diagnose SMA type 2 by two years of age. Children with SMA type 2 usually never have the ability to walk. Some may have the ability to stand or crawl, especially with assistance, when they are very young. After the age of two or three, children with SMA type 2 have weak arms, legs, and trunk muscles. By then, they require power wheelchairs for mobility. Children with type 2 have weak chest cavity muscles, though not as severe as type 1. As with all types of SMA, the common cold can turn into a dangerous threat if it isn’t treated early and aggressively. Children with type 2 may also have some difficulty swallowing and chew, but they can usually eat without needing a feeding tube. They may lose range of motion because of contractures. Scoliosis occurs as a child with type 2 grows and gets bigger. There is no specific life span. Doctors usually diagnose SMA type 3 before the child is three years old. Children with type 3 have muscle weakness, though it is not as severe as that in type 2 or 3. They usually have the ability to walk, though they may get tired quickly and fall down often. They also may have trouble getting up from the floor. They may require braces or wheelchairs for mobility, especially when they get older. People with SMA have a missing or defective gene called Survival Motor Neuron (SMN) 1. Each parent must be a carrier of the defective gene. When that match occurs, there is a 25 percent chance in each birth that the child will have SMA. The SMN1 gene is suppose to produce SMN protein, which is necessary for the survival of certain nerve cells in the spinal cord called motor neurons. When the motor neurons don’t get enough protein, they shrink and eventually die. The ability of the brain to control the muscles diminishes. With less control and use, the muscles weaken and waste away.